To Cite: Taheri M, Yousefi K, Naderi M, Hashemi M. Genetic Variation in Akt1 and Risk of Tuberculosis Among Iranian Population, Health Scope. 2014 ; 3(2):e16243. doi: 10.17795/jhealthscope-16243. Background: Tuberculosis (TB) is one of the earliest human diseases which still is considered a public health problem. Both genetic and environmental factors may contribute the susceptibility to tuberculosis. Objectives: Akt is a serine/threonine kinase that has an important role in several cellular processes such as cell cycle control, cell survival, and cellular immigration. The Akt signaling pathway has an essential function in incursion and reproduction of numerous bacteria. Polymorphisms in the Akt genes are known to be related with outcome of infections. We investigated a possible association between Akt1 726 G/A polymorphism and pulmonary tuberculosis (PTB) in Iranian patients with PTB. Analysis of the data was done using χ2, and independent sample t-test. Genotypes analysis between the groups was done using logistic regression analyses. Patients and Methods: This case-control study was performed on 156 patients with pulmonary tuberculosis and 154 healthy controls. 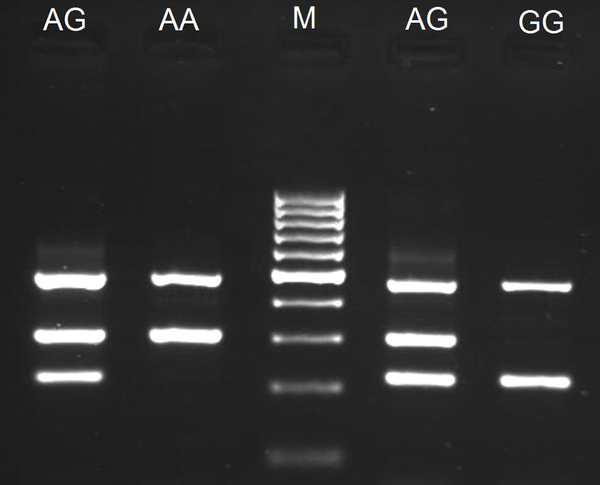 For detection of polymorphism, we used tetra amplification refractory mutation system-polymerase chain reaction (T-ARMS- PCR) and for determination of PCR products size, we used agarose gel electrophoresis. Results: Frequencies of genotypes GG, GA, and AA of the Akt1 726 G/A polymorphism were 45.6%, 47.4%, and 7% in the patients with pulmonary tuberculosis, and 53.9%, 37.0% and 9.1% in the control group, respectively. G allele frequency was 69.2% in patients with PTB and 72.4% in healthy controls. We observed no significant difference in allele and genotype frequencies of the Akt1 polymorphism between patients with PTB and healthy controls. Conclusions: Our finding showed that Akt1 726 G/A polymorphism was not associated with risk of PTB in our population. More studies are necessary to validate our results. Tuberculosis (TB) is one of the earliest human diseases that is still a public health problem, particularly in developing countries, and cause of morbidity and mortality throughout the world. In 2012, World Health Organization (WHO) predicted the incidence rate of about 8.6 million cases of TB that most of them would occur in Asia (55%) and Africa (30%) (1). With approximately 1.5 million death per year, TB is the major cause of adults’ decease from a distinct infectious agent (2). While the incidence rate of TB in Iran is 28 cases per 100,000 populations, its prevalence in Zahedan (center of Sistan and Baluchistan province) is higher than other regions of the country (3). According to the Ministry of Health and Medical Education, incidence rate of TB in Zabol and Zahedan are 109.7 and 36.6 cases per 100,000 people, respectively (4). It was estimated that almost one-third of the world population had encountered with Mycobacterium tuberculosis among which only 10% reveal the clinical disease. Data collection implicates that genetic factors are important risk factors for outspread of TB (5, 6). Akt (V-akt murine thymoma viral oncogenes homolog 1), entitled as protein kinase B (PKB), is a serine/threonine protein kinase that has essential function in many cell procedures including apoptosis, cell proliferation, cell immigration, and controlling the intracellular signal transduction (7, 8). By prevention of apoptotic cascade, Akt1 plays role in cellular survival pathway. Indeed, As an affirmative regulator of NF-κB, Akt is involved in transcription of anti-apoptotic genes with activation of IκB kinase (9). Besides, by phosphorylation of BAD, Akt causes separation of BAD from the Bcl-2/Bcl-X complex that causes losing its pro-apoptotic function (10). Wang et al. demonstrated that Akt1 monitors intracellular growth of M. tuberculosis by modulating host cell signaling pathways (11). Three isoforms of Akt, namely, Akt1, Akt2, and Akt3 have been recognized in humans that are coded by different genes. Every Akt kinases possess a wide range of substrates and therefore, is involved in several signaling pathways (8). The Akt1 gene is located on chromosome 14q and contains many polymorphisms. Akt1 726 G/A (rs1130233) is a synonymous polymorphism that is located in exon 9 of the AKT1 gene (11). By the time of submission of this manuscript, there was only one report concerning the association of Akt1 gene polymorphisms and pulmonary tuberculosis (PTB) (11). The aim of this case-control study was to determine the frequency of Akt1 726 G/A polymorphism among patients with PTB and healthy individuals in southeast of Iran and to find any association with susceptibility or resistance to PTB. In this case-control study, 156 patients with PTB who were referred to the Research Center for Infectious Diseases and Tropical Medicine, Bouali Hospital, Zahedan, and 154 healthy individuals without any clinical symptoms or family records of TB from the same ethnicity as patients were enrolled. We enrolled all patients under treatment as well as new cases from June 2011 through August 2012. Patients were diagnosed with PTB on the basis of clinical signs, chest X-ray imaging, and findings from bacterial assessment as described earlier (12). The subjects who underwent treatment for PTB and newly diagnosed PTB cases were enrolled in the study within the case group. Control individuals were selected from the Zahedan population showing no recent signs, symptoms, or history of PTB. The project was approved by the local Ethics Committee of the Zahedan University of Medical Sciences, and written informed consent was signed by all individuals. We obtain blood sample from all participants in Na-EDTA tubes and stored them at -20°C until DNA purification. Genomic DNA was purified from 500 μL of blood samples, using the salting out method as described in the previous study (13). Measurement of DNA Purity and final concentrations were done through spectrophotometry. Genotyping of Akt1 SNP was done by tetra amplification refractory mutation system-polymerase chain reaction (T-ARMS-PCR) method, which is an easy and fast method for finding single nucleotide polymorphism (SNP) (14). The Akt1 genomic sequence (NC_000014.8) was obtained from the National Center for Biotechnology Information (NCBI) (http://www.ncbi.nlm.nih.gov). The polymorphisms were searched and primers for T-ARMS-PCR were designed. We used four primers, two external primers (forward outer: 5’- GGCTACTCTCCATGGCACCAGAC -3’, reverse outer: 5’- GAGGTTCTCCAGCTAGGGGAAAGG -3’) and two allele-specific internal primers (forward inner [G allele]: 5’- TGTTCTTCCACCTGTCCCGGTAG 3’ reverse inner [A allele]: 5’- CCGGTCCTCGGAGAACACAAGT -3’). 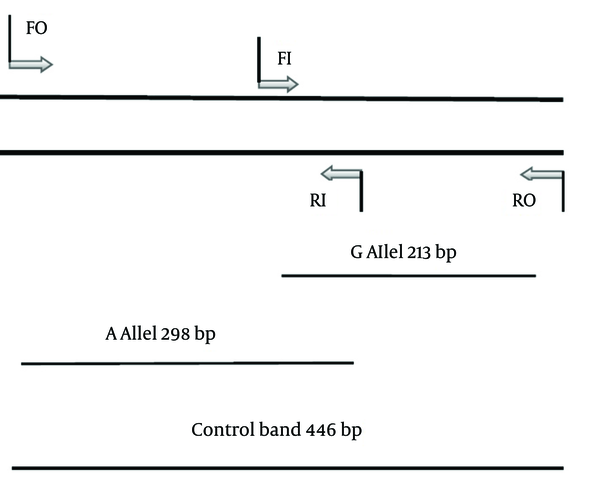 Product sizes were 213 bp for G allele, 298 bp for A allele, and 466 bp for the two outer primers (control band) as is illustrated schematically in Figure 1). We used commercially available PCR premix (AccuPower PCR PreMix, BIONEER, Daejeon, South Korea) to perform of Polymerase chain reaction (PCR) according to the manufacturer-recommended protocol. Briefly, we added 1 μL template DNA (~100 ng/μL), 1 μL of each primer (10 pmol/μL), and 15 μL DNase-free to a 0.2 mL PCR tube that contained the AccuPower PCR Pre-Mix. The PCR program that was used to amplify the Akt1726 G/A (rs1130233) was as follows: five minutes at 95°C, followed by 30 cycles of 30 s at 95°C, 30 seconds at 58°C, and 30 seconds at 72°C, with a final step at 72°C for ten minutes. Analysis of PCR products was done by electrophoresis on a 2% agarose gel, containing 0.5 μg/mL ethidium bromides, observed with an ultraviolet transilluminator, and photographed (Figure 2). The 100 bp DNA ladder marker was used as the molecular size standards (Figure 2). In order to verify the results, 10% of the samples were approximately re-genotyped. By double-checking, we confirmed the previous genotyping results. Two forward and two reverse specific primers were used to produce three potential products. Product sizes were 213 bp for G allele, 298 bp for A allele, and 466 bp for two outer primers (control band). In T-ARMS-PCR method, two external primers (control band) and two inner primers (allele specific primers) were used. The product sizes for detection of Akt1 726 G/A (rs1130233) polymorphism were 213 bp for G allele, 298 bp for A allele, and 466 bp for control band. M stands for DNA marker. The statistical analysis of data was done by the SPSS software v.18.0 (SPSS Inc., Chicago, Il, USA). In order to compare allele and genotype frequencies in patients with PTB and healthy control subjects, we used the χ2 test. Independent sample t test was used for demographics and continuous data. Odds ratios (ORs) and 95% confidence intervals (CIs) were calculated with logistic regression analyses. P value less than 0.05 was considered statistically significant. The average age of participants was 49.8 ± 20.7 years (ranging from 12 to 98 years of age) in patients with TB and 48.1 ± 15.6 years (ranging from 22 to 83 years of age) in the control group. Number of females in the TB group was 98 (62.8%) and in control group was 87 (56.5%). There was no significant difference between groups concerning gender and age (P > 0.050). The genotype and allele frequency of Akt1 726 G/A (rs1130233) gene polymorphism are shown in Table 1. Of the 156 patients with TB, 71 (45.6%) were GG type, 74 (47.4%) were GA, and 11 (7%) were AA. Of the 154 healthy control subjects, 83 (53.9%) had the GG genotype, 57 (37%) had the GA type, and 14 (9.1%) had the AA type. As shown in Table 1, there was no significant differences in the genotypes frequencies between the PTB and control groups regarding Akt1 rs1130233 (726 G/A) polymorphism (χ2 = 3.48, P = 0.175). The Akt1 726 G/A polymorphism (rs1130233) was not associated with TB in codominant, dominant, and recessive tested inheritance models (Table 1). No significant differences were observed among patients with PTB and controls regarding allele frequencies (P = 0.380). We calculated Hardy-Weinberg equilibrium (HWE) in cases and controls. The Akt1 726 G/A (rs1130233) genotypes in both controls and cases were in Hardy-Weinberg equilibrium (χ2 = 0.831, P = 0.359 and χ2 = 2.00, P = 0.156, respectively). b Abbreviations: 95%CI, confidence interval at 95%; OR, odds ratio; PTB, pulmonary tuberculosis. In this study, we aimed to see whether the Akt1 polymorphisms at position 726 G/A had any association with susceptibility to TB in Iranian patients with PTB. We found no association between Akt1 726 G/A (rs1130233) polymorphism and susceptibility to PTB. Akt (also known as PKB) is a family of serine/threonine protein kinases. It has important roles in numerous cellular procedures including cell cycle regulation, cell survival, NF-κB dependent gene transcription, and cell immigration (15). In many cell types, Akt influences survival and arrests apoptosis through some stimuli such as retrieve of growth factor and anoikis (9). The Akt has an essential role in invasion and reproduction of several microorganisms (16). Akt1 has several polymorphisms that many of them have been associated with several diseases such as Parkinson’s disease, Schizophrenia, and bipolar disorder (7, 16). By the time of submission of this manuscript, there was only one report regarding the association of Akt1 polymorphisms and TB and this was the first report from Iran. The earliest report concerning the role of Akt1 in defense against intracellular pathogens was Kuijl et al. study (17). They reported Akt1 as a key kinase that controls intracellular growth of M. tuberculosis through regulating host cell signaling pathways. They demonstrated that in macrophages, a particular tiny particle inhibitor of Akt1 could considerably reduce proliferation of M. tuberculosis (17). The result of Akt1 inhibition is induction of phagosome conversion to phagolysosomes and destruction of the intracellular bacteria (16). In a study on Chinese population, Wang et al. (11) found that in patients with PTB, IVS3+18 C⁄C genotype was lower than controls and the patients with PTB had higher C⁄T genotype in contrast to the control group. Moreover, they demonstrated that allele frequency of IVS3+18 C and T showed significant difference between patients with PTB and control group. They revealed that IVS3+18 C⁄C homozygous genotype not only was not a risk factor of PTB but also was a protector factor against PTB. In agreement with our study, they showed the prevalence of Akt1 726 G⁄A polymorphism was had no significant difference between patients with PTB and healthy individuals; however, 726 G⁄G genotype was lower in patients with PTB than in controls. Their results showed there was not any association between Akt1 726 G/A (rs1130233) polymorphism and susceptibility to PTB (11). Previous researches demonstrated that polymorphism in this gene alters expression or activity of Akt1 (18). Huang et al. (16) showed mycobacterium infection induced phosphorylation of the host cell Akt and restraint of Akt activity decreased dosage of intracellular infection. Moreover, they demonstrated that Akt postponed phagosomal-lysosomal fusion and therefore, increased intracellular survival of the mycobacteria (16). In conclusion, our data recommended that Akt1 726 G/A gene polymorphism was not associated with any risk of or protection against PTB in southeast of Iran population. More researches with different ethnicity are needed to confirm our results. This work was supported by dissertation grant from Zahedan University of Medical Sciences. The authors expressed their gratitude to all the patients especially the healthy subjects who willingly participated in the study. Implication for health policy/practice/research/medical education: This study evaluates the impact of Akt1 726 G/A polymorphism and pulmonary tuberculosis (PTB), carried out on a sample of subjects from Iranian population. Authors’ Contribution: All authors made extensive contribution into study design, data collection, analysis and interpretation of the data, drafting and final approval the manuscript. Financial Disclosure: The authors had no conflicts of interests. Funding/Support: This project was supported by a dissertation grant from Zahedan University of Medical Sciences.